I know. 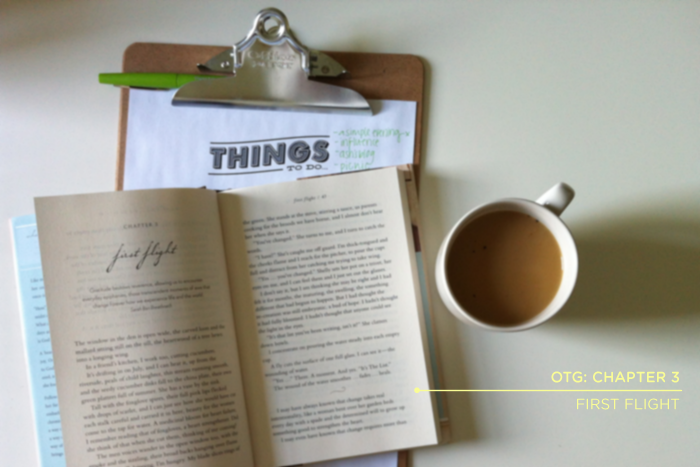 I missed last week's Book Club link up. Sigh. Forgive me? I was sick last Thursday. This is the brilliantly beautiful quote that Ann opens up chapter three with. This chapter was extremely highlight-able. I highlighted so many wonderful, beautifully poignant thoughts from Ann herself, but this quote up above really struck me the most, mostly because I know that feeling. And sometimes I let myself forget that feeling too. Yes, I know that feeling, the one that searches constantly every day to find and count the gifts given; and when they are found they transform instantly into joy and epiphanies and those grand moments of awe inspiring. Yes, it is in the simple moments, the seemingly mundane that we find blessings and joy hidden in wait for us. It's that moment when I constantly thank the Lord for His many gifts throughout my day that I find myself drawn closer into His wings. This act of counting gifts is very much so an act of transcendence. This new found conscious act of thankfulness changes things, it changes me, it has been changing me and I pray it will continue on. It's funny to me that this was the week that God had me read this chapter on the "Sanctuary of Time," because this week I have wanted nothing more than for time to fly swiftly by. To be honest, I just wanted my vacation time off of work to just get here already! But I think God wants me to take to heart that time is indeed a gift. What we do with that gift, is for the most part, entirely up to us in the end. So, after having read through this chapter this week I decided that even if all the nights I've worked at the bookstore this week were slow (which they were, ridiculously slow in fact) that I was going to purpose myself not to moan and groan over slowly rolling time and work, etc, because TIME is a GIFT. I've been waiting for today to get here for over a week now...because today is the day before I head out on the open road and drive for five hours to reach my dearest love, Jared. It was honestly hard to not wish the time away this week; for me to slow way down and commit my days to seeking after gifts given, instead of wasting my time wishing it all away. The task of searching out gifts is not as hard deciding daily to reflect upon them, to decide to learn something from them, from Him. But I am learning much through this new found perspective, this new perspective seen through gratitude filled eyes and sanctified daily hours given. I am learning more and more, and day by day, that God is in those still quiet moments. And He is also found in the midst of those hectic, rushing-by-days, the days where gifts are harder to look for, to count and to keep track of. "In our rushing, bulls in china shops, we break our own lives." I've found the quote above to be true. Those days when I want nothing more than to just rush through the day and forget *my* world, forget everything, I find myself to be a little bit more broken than I was before. I miss out on counting the gifts given. I miss out on communing with my God. I miss the gift of precious time given altogether because I do not count every moment worthy, or a blessing. So, what is my point, after all of the extreme wordy-ness above? My point is this: I do not want to waste the time God has given me, so I must count it consecrated. 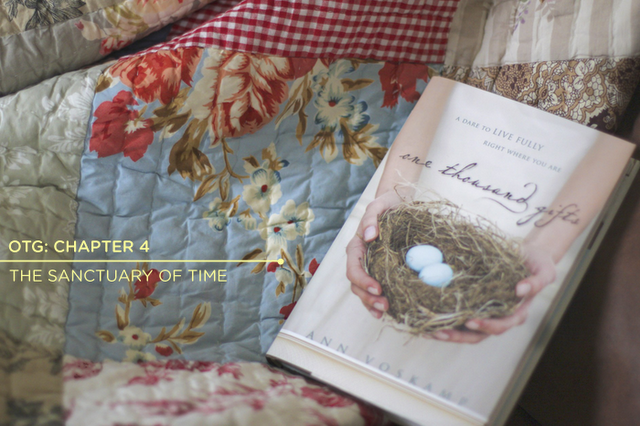 I'm reading One Thousand Gifts by Ann Voskamp for the next little while alongside Annie & Margaret. Would you like to join The Book Club too? love these! i love seeing the evolution of you learning to focus on the small and finding Him in it.